When added, double click on it to edit the code that will be executed. 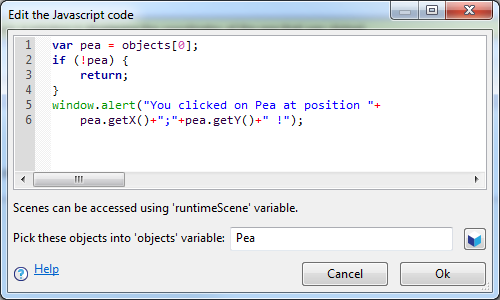 Note that in the code, you have access to a variable named runtimeScene representing the scene being played. If you choose some objects in the field below the code, then an objects variable will be available. It's an array containing the selected objects. runtimeScene.setBackgroundColor(0,0,255); //Set the background to blue. objects[i].setX(50); //Set the X position of all picked objects to 50. Then, activate the use of external source files in your game property (right click on the game name in the Project Manager, than choose properties, and finally check Activate the use of C++/JS source files). Now there is a new item in the structure of your projet called Sources. Make a right click on it to choose to create a new source file or to import an existing one. You can edit the files using GD integrated editor or you preferred text editor (take a look at Sublime Text). When your game will be exported or when you launch a preview, the source files will be integrated to the game. Always use the debugging tools available in your browser to check if you made errors in your code: any error will block the game from running. Developers tools are most of the time available by pressing F12 in your browser. Read the documentation to know how to use the objects and functions provided by GDevelop. See the documentation of gdjs.Variable and gdjs.VariablesContainer.